» Take M50 Southbound, which continues onto the N11. » Stay on the N11 to KILMACANOQUE, taking the left slip road immediately after the petrol station. » Follow all the signs for ROUNDWOOD. » You will drive through Roundwood, Annamoe and into LARAGH. » Coming into Laragh stay left for the village and turn left at LYNHAMS Pub. » Then take the next left (after the sign for the WOOLEN MILLS). » Drive along this road for approx 10 to 15 mins until you see a white cottage on the left (on the road edge-it usually has a flag hanging outside). » Take the entrance opposite CRONEYBYRNE COURTYARD. » Turn right to the Wicklow Gap road through HOLLYWOOD, WICKLOW GAP and into GLENDALOUGH. » Continue on into LARAGH. » Turn right in Laragh at LYNHAMS pub. » Carry on and take the first left turn. » Drive along this road for approx 10 mins until you see a white cottage on the edge of the road with a flag hanging outside (on your left). 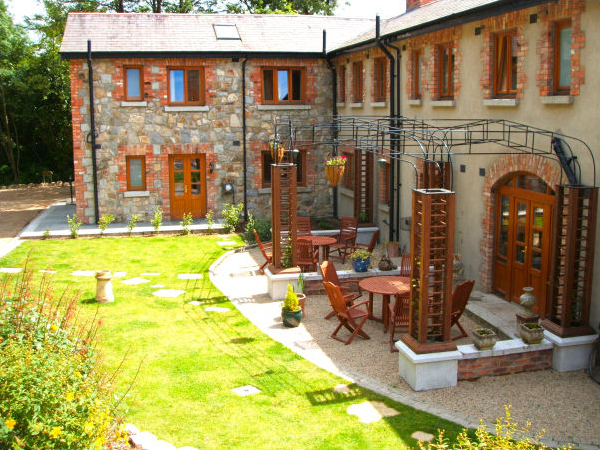 » Take the entrance opposite this CRONEYBYRNE COURTYARD. » Down the avenue take the 2nd right turn. » Take the N 25 to Wexford. 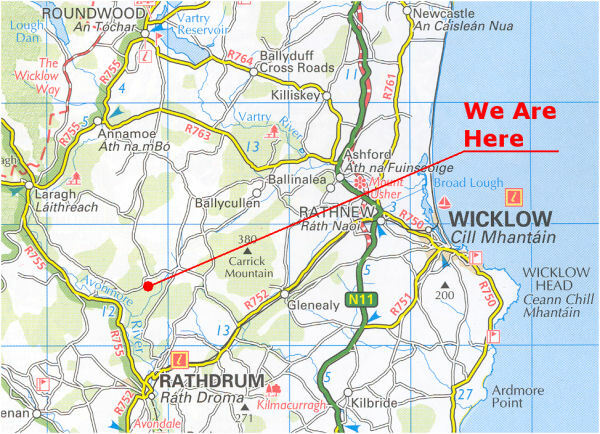 Then onto the N11 passing Enniscorthy, Gorey, Arklow and take the exit for Rathdrum. » When you come off the motorway head for Glenealy/Rathdrum. » Go through Glenealy village, pass a garden centre on the left and on a series of bad bends there is a right turn. » The sign says ‘Scenic route’. Travel straight along this road, up a very windy road and straight on. » You will come to a fork in the road (with 3 roads on it-only in Ireland! )-Take the middle road. Go straight to the end of the road. » Take a right turn and immediate left (onto the Laragh/Glendalough road). » Drive along this road for a few minutes until you see the sign on your left ‘CRONEYBYRNE COURTYARD HOLIDAY HOMES’. 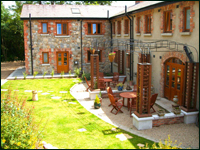 » Drive down the avenue and park on the left in the car park or on the right beside the Courtyard. » From Kilkenny go towards Carlow. » Then head for Hackestown and into Tinahealy. » Stay on the road by passing Rathdrum Main Street. You will pass the small petrol station on your left and then you will see Glanbia on your right. » Take the left turn just after Glanbia-heading for Moneystown/Roundwood. » Drive along this road staying left when you come to the fork in the road. » Stay on this road until you come to the junction. Take a left here (the sign says Laragh/Glendalough).